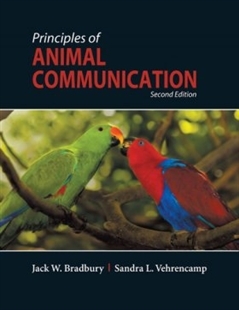 Animal communication continues to be one of the most active and popular topics in behavioral ecology, neurobiology, and evolutionary biology. An enormous amount of relevant new research has been published since the 1st edition, and over 90% of the citations in this new edition were published since the 1st edition appeared. Although the basic order of topics is similar, this 2nd edition is a completely new book. The topics in the 26 chapters of the 1st edition have been condensed and integrated into 16 chapters in the new version so as to better accommodate upper-division undergraduate courses with 15-week semesters. The text omits boxes and, instead, the relevant mathematics, more advanced considerations, citation bibliographies, and web links for topic enrichment have been assembled into chapter-specific and freely accessible web modules. This was done to improve the flow for undergraduates, while still providing access to more technical details and scholarly sources for graduate courses and professional users. Figures and photos are now full-color and the book has a larger format that makes for easier reading. This edition retains the broad taxonomic and sensory scope of the 1st edition and even adds coverage of several modalities and taxa not discussed in the 1st edition. As with the 1st edition, every chapter concludes with an itemized summary of major points and suggestions for additional reading. As the title suggests, the emphasis in the text is on identifying general principles that apply broadly across taxa and modalities. At the same time, major effort has been expended to integrate these principles with the accepted principles of economics and other fields of science. Given this integrative nature, animal communication is a topic that can serve both as an appealing entry point to science for younger students and as a coalescing of separate disciplines for more senior ones.